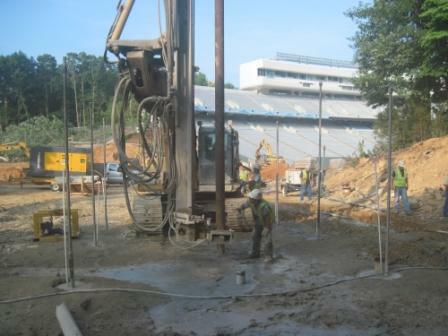 Despite foundation challenges, construction is almost complete on the expansion at University of North Carolina’s Kenan stadium. The project started with a deep foundation system from design-build contractor GeoStructures. Known as the Carolina Student-Athlete Center for Excellence, the addition was built on a parcel with a knotty mix of fill soils, subsurface boulders and varying depths to rock. To achieve uniform foundation support, GeoStructures designed a Micropile system (also known as a Mini pile system) which could be drilled into the variable ground conditions. After an pre-production load testing program that provided an optimized design, GeoStructures proceeded with installation of 265 micropiles ranging in capacity from 80 tons (160 kips) to 175 tons (350 kips) each. Although most were designed for compression loading only, designs in some areas called for tension resistance due to lateral loading. All of the micropiles were cased to rock with internal reinforcement and socketed into hard bedrock present at the site. For a video peek into the various construction phases, check out UNC’s “Hard Hat Hits”. Do you have experience wiht micropile systems? Foundation or soil tales of woe? Just love the Tarheels? Drop me a note in the comments section, below. « Wind Power: It’s in the air!